This beautiful 47ft sailboat offers great cockpit shade and is equipped with bean bags on the foredeck. The salon is well appointed with a large galley and 3 staterooms and 3 marine bathrooms. Apart from her performance at sea and the huge amount of space that set this boat apart, this architecture makes optimal use of the cockpit beam. An incredibly efficient deck plan makes her wonderfully safe and easy to use. 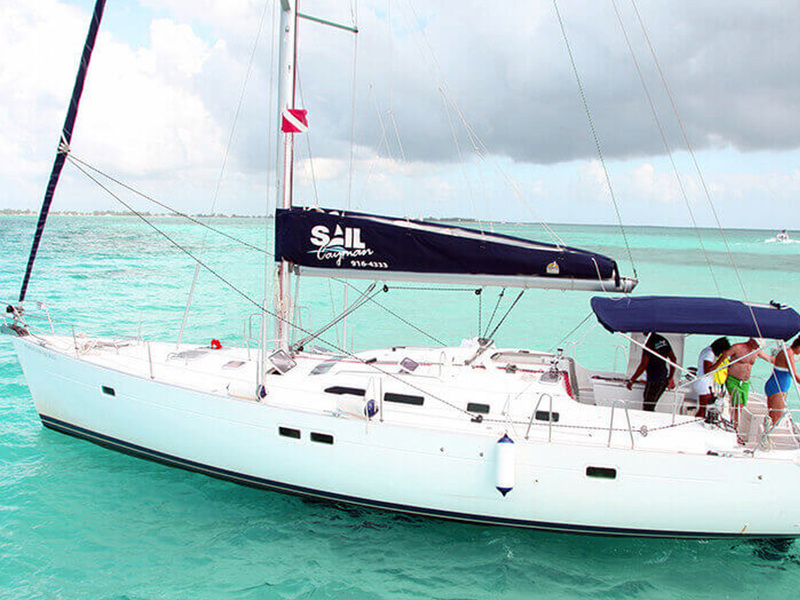 This vessel can comfortably hold 12 guests for sailing trips within the North Sound Lagoon or around Grand Cayman. The vessel is also available for multi-day charters as it can sleep up to 8 guests. Visit the neighboring Island of Cayman Brac, Little Cayman or even Cuba on these multiday cruises. Enjoy a luxurious 4 hour charter visiting the "Original Stingray City" were you enjoy full interaction with the Rays in 10 ft of crystal clear waters with snorkeling gear and floaties with as extra an abundance of tropical fish. Other stops can include the Coral Gardens, Barrier Reef and Starfish Beach where we lounge around in knee depth water checking out the sea stars. Typically we stay off the beaten path with 2 stops on the half day. Alcoholic drinks can be provided at cost or bring your own! Enjoy a luxurious 7 hour charter visiting the original Stingray City were you enjoy full interaction with the Rays in 10 ft of crystal clear waters with snorkeling gear and floaties with as extra an abundance of tropical fish. Other stops can include the Coral Gardens, Barrier Reef and Starfish Beach where we lounge around in knee depth water checking out the sea stars. Typically we stay off the beaten path with 4 stops on the full day and a at one of the beach restaurants like Rum Point or Kaibo for lunch (lunch not incl.) Alcoholic drinks can be provided at cost or bring your own!